I hope you find great value in these Quotes about Heroes from my large collection of inspirational quotes and motivational sayings. but the firm resolve of virtue and reason. Joe Louis was one of my first heroes. Vietnam helped me realize who the true heroes really are in this world. It's not the home-run hitters. Heroes to me are guys that sit in libraries. to become replete with knowledge. there are heroes who rise above it. who the heroes and heroines are or were. Michael Mann's always been one of my heroes. cane for the sword Excalibur. Death, after all, is the common expectation from birth. Neither heroes nor cowards can escape it. What has made this nation great? Not its heroes but its households. We all want heroes and we all want somebody to look up to. we have embraced the heroes it has produced. and they should never be forgotten. Our men and women in our armed forces are the real heroes in this conflict. I identify with the Clint Eastwoods and Harrison Fords. unlikely strangers because it's more exciting really. my aunt, my grandmother, those are my heroes. Abraham Lincoln and King David. John Wayne isn't dead, Elvis isn't dead. Otherwise you don't have a hero. You can't kill a hero. That's why I never let him get older. Hard times don't create heroes. It is during the hard times when the 'hero' within us is revealed. The world doesn't make any heroes anymore. The heroes of the present will retreat to the imitation they are anyhow. the latter do what the former conceive. I was always more inclined to listen to ballads. You need a good mixture to make it work. The real heroes were my good buddies who died during the battles. sensuality, and the narrow self. project is a sense of play. Things have gotten so dreary. The heroes have gotten so ugly that even their muscles have muscles. I never had any acting heroes. I never really went to the theatre. Nurture your minds with great thoughts. To believe in the heroic makes heroes. Dean Martin is one of my heroes. as honest an account of himself as he could. the greatest braggarts are generally the merest cowards. but I'm an unbelievable hero in Germany. And Germany needs heroes more than any place. old, young, and in between. but it is sort of necessary. they are the true heroes. and we give support to human rights heroes. the face of awful adversity. Heroes named and unnamed, some known only to God. are mortal and not divine. We are all as God made us and many of us much worse. being either heroes or villains. Oklahomans value our children and our seniors. Oklahomans value traditions of faith. Oklahomans value our heroes, our veterans. Oklahomans value innovation and the creative arts. something that expresses our resolve. life by enchanting stories of the virtues of the heroes of old. 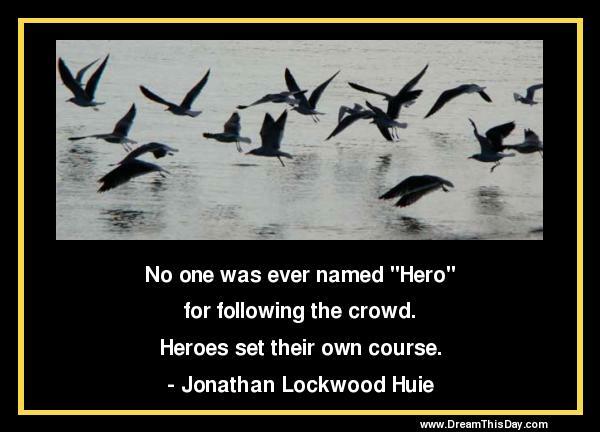 Thank you for visiting: Heroes Quotes.